BEIJING -- China's environment authorities have stepped up efforts to ensure a blue sky and clean air for war commemoration activities centering on a military parade to be staged in Tian'anmen Square on Sept 3. The Ministry of Environment ordered Beijing and its six surrounding provincial regions to "swiftly take action" to ensure a sound environment during the events, its statement said Friday. Beijing, Tianjin, Hebei, Shanxi, Inner Mongolia, Shandong and Henan authorities were given a deadline of Aug 28 for monitoring various industries and shutting down companies with excessive emissions. Heads of the seven local governments will take the major responsibilities for the mission, it said. More than 12,200 coal-fired boilers and factories in polluting industries in these regions will suspend production starting Aug 28. Motor vehicles, especially trucks from out of town, will be restricted from entering the capital. Cars with excess emissions will not be allowed to enter. Beijing started to restrict the number of private vehicles on its roads on Thursday to ensure blue skies. Vehicles will be allowed on the roads based on odd or even license plate numbers up to and including Sept 3. The ban does not apply to ambulances, fire engines, road maintenance vehicles, those carrying foodstuffs, or electric vehicles. It has been estimated by the transportation authority that the restrictions will cut the use of vehicles by 35 to 50 percent. Eighty percent of the vehicles used by government bureaus and institutes will also be banned from use during the period. 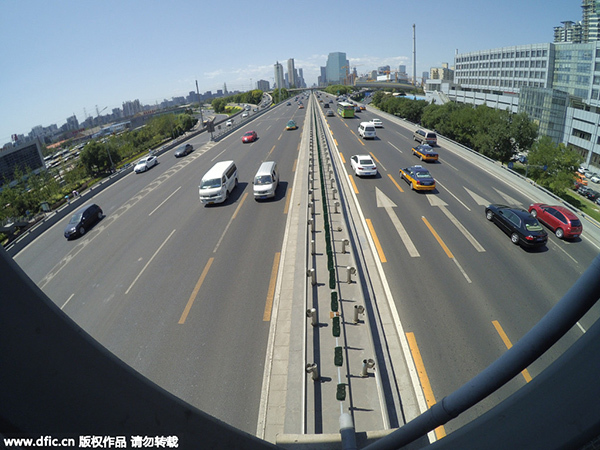 The Beijing Commission of Transportation said on Thursday that traffic was mildly congested and had been reduced by 30 percent from average levels. In the environment ministry's latest inspections, it checked and regulated 241 companies, 45 construction sites and a large number of outdoor barbecue stalls. It also secretly visited some factories in Dingzhou City, Hebei Province, saying the environment situation there is "not optimistic."